Using 16.04 lts verison ubuntu. Initially my Pendrive was not detected. So followed mounting steps. Sudo mkdir /media/USBSTICK Sudo mount -t vfat /dev/sdc1 /media/USBSTICK And it was detected and I can see the files now. 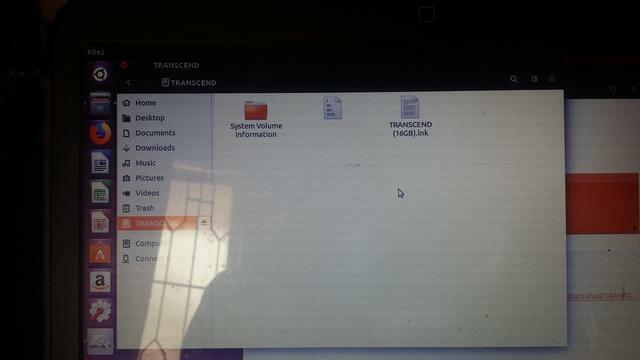 A day back the files were turned to shortcut link named transcend.Ink when the Pendrive was inserted in other system. 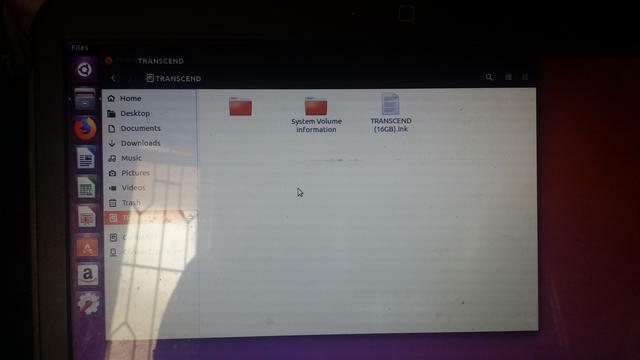 So now when I inserted in my ubuntu system I see these .Ink files. In 5 minutes those files suddenly disappeared. I don't understand what is this.please note I have not clicked on any files or run any files in that Pendrive. Please can anyone explain what just happened. 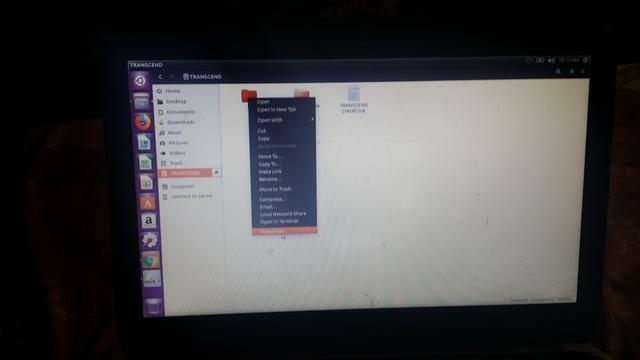 Did my ubuntu system got infected with it? Also permissions for Pendrive says "you are not the owner,so you cannot change the permissions "
I have seen another problem in the same Pendrive. 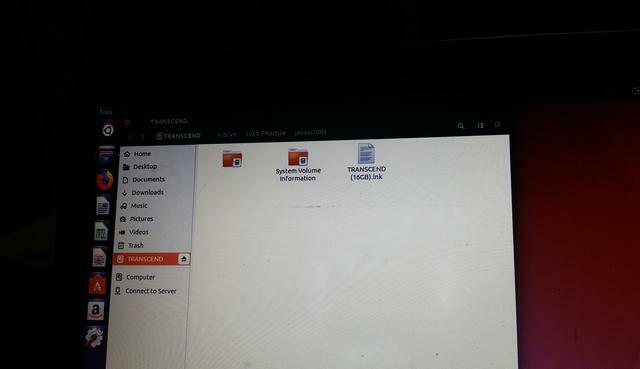 One folder which is visible and when I go in and come out of that, a lock symbol appears on that folder and one time another folder when I go in and come out, got converted to binary file and again converted to folder type. Please can you tell if this is a symptom of virus. Please check below 4 links uploaded snapshot of that bug or virus. It sounds like that "other system" was a Windows system. Is it possible that on that Windows system you did a "create shortcut" instead of actually copying the files? The .lnk files are Windows version of Linux symbolic link. They mean nothing in Linux. Go back to that other system and recopy the files. FYI: Regular links are just two names on the same disk for a single file. Think of it as a nickname. If you delete either of the names, the file is still in the folder where the link name is. Physically, the file did not move. The system just created another entry in the new folder pointing to the place on the disk where the data was and updated the link count by one. When you delete a name, if the link count is more than one, the link count is reduced by one but the file is not touched. The only rule is that the two names must exist on the same drive. On the other hand, Symbolic links are just pointers to the file even if the file is on another disk. Deleting the original file (or removing the drive where it exists) makes the pointer point to nothing. So when you create symbolic links (by creating shortcuts), all it does is create pointers on the new drive. It works fine as long as your drive with the shortcuts and the drive with the real file are both there. However, once you move that pendrive, its pointers no longer have meaning. Think of symbolic links as forwarding phone number. The phone carrier (system) sees a pointer to a new phone and goes to that new phone. But if the person got rid of the new phone number, there is no way to forward it. What is reason for automatic file lock symbol or automatic binary file conversion?